A sweet collection of crafting downloads and musings. These uplifting patterns will keep your hands busy and your heart happy. Create a little something for your home while you acknowledge the life you've created. Peruse while drinking coffee or have a crafternoon. 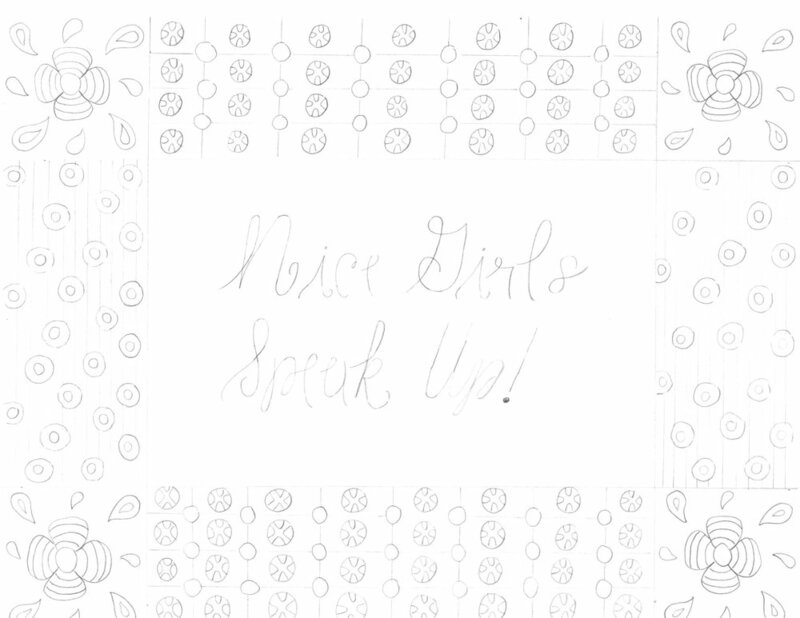 Nice Girls Speak Up! Say your piece on a pillow or just let off some steam and color your self to calm. Fun embroidery project. Check out Jenny Hart Videos for Basic stitches and how to transfer the pattern to 8x10 piece of cloth. Take the next positive step. Create a reminder for yourself that big changes happen one step at a time. Adorable coloring page or embroidery project. Check out Jenny Hart Videos for basic stitches and transferring. This link takes you to the Sublime Stitching Blog of Jenny Hart. This post will show you what supplies you need and step by step instructions to transfer a pattern onto cloth for embroidery. This link takes you to Sublime Stitching Blog by Jenny Hart for basic embroidery stitching tutorials. Jenny Hart is a well known embroidery artist that has a shop for supplies, books and videos teaching others how to embroider. I've used her methods and I find them easy to follow. I look around my house and I see the story of my family and my life. Happiness lives in second hand furniture.